There are few words to describe what happened in Game 3 of the ALDS between the Yankees and Red Sox. 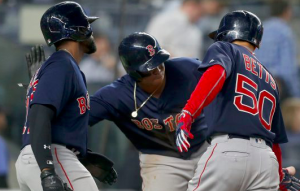 Luis Severino had his world rocked by Boston’s bats in what ended up being a 16-1 win for the Red Sox. All five Yankees relievers used, including backup catcher Austin Romine, all gave up at least one run as well. The Yankees are now one game away from elimination as they try to bounce back in Tuesday’s Game 4. If there’s a silver lining for the Yankees after Game 3, it could be that they didn’t have to use any of their top bullpen arms. The likes of Aroldis Chapman, Dellin Betances, and Zach Britton are all rested and ready to go. Of course, the Red Sox also rested their bullpen with Nathan Eovaldi going seven strong innings. Specifically, Boston closer Craig Kimbrel will be ready to go for possibly more than an inning as the Red Sox try to close out the series. In an elimination game, the Yankees will turn to C.C. Sabathia to keep them alive. The 38-year old had some troubling starts down the stretch but did finish the season 9-7 with a 3.65 ERA. Sabathia was also more effective this season at home, which is a reason to be optimistic. It’s worth noting that it’s been 12 days since Sabathia last took the mound, so he may not be as sharp as he wants to be. Of course, he will be well-rested after a long season. Most importantly, Sabathia won’t be overwhelmed by the moment. He has 22 career postseason starts, including four last season. The Red Sox will counter with Rick Porcello, who got two outs in relief in Game 1 and will be back to start Game 4. The former Cy Young winner won 17 games this year despite a modest 4.28 ERA. He had a couple outstanding starts against this Yankees at Fenway Park but struggled against them while pitching at Yankee Stadium in May. Porcello also has a 5.33 postseason ERA in four starts and eight relief appearances. The X-factor for the Yankees in Game 4 could be Aaron Hicks, who has sat the last two games after hurting his hamstring in Game 1. It appears that Hicks could be in the Game 4 lineup, which could give the Yankees a nice boost. Hicks doesn’t have good numbers against Porcello while his replacement Brett Gardner does. However, Hicks would give the Yankees a left-handed power bat in the middle of their lineup, providing some balance to an otherwise right-handed heavy lineup. Outside of Mookie Betts, Sabathia has good numbers in his career against most of Boston’s regulars. However, one possible X-factor for the Red Sox in Steve Pearce. The veteran utility man is 12 for 38 (.316) with three doubles and three home runs in his career against Sabathia. He could potentially start at first base or be put in the lineup at DH, forcing J.D. Martinez into the outfield at the expense of Jackie Bradley Jr. Either way, he could provide some depth in Boston’s lineup and give them an extra hitter with a good track record against Sabathia. Look for the Yankees to bounce back from Monday’s lopsided affair. They’ll come out swinging against Porcello and try to do damage early. If the Yankees can get three or four good innings from Sabathia, the likes of Chapman, Betances, and Britton may be able to take it the rest of the way, as all three could pitch more than an inning. In short, the Yankees will pull out all the stops to win this game whereas the Red Sox won’t, knowing they have Chris Sale lined up for Game 5. New York wins 7-3.